The comedian known for his roles in movies such as “Anchorman: The Legend of Ron Burgundy” and “Waiting…” as well as the hit NBC television series “The Office,” will step onto the downtown stage of the Muncie Civic Theatre this weekend after months of preparation. Actor and comedian David Koechner will perform a stand-up routine at 7:30 p.m. on Saturday. 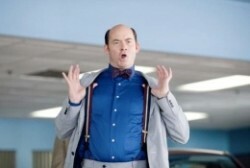 The funny man on screen, Koechner insists he’s not much like the characters he plays. And just like his transition from political science to acting, stand-up comedy is also something that’s relatively new for him.